Ongoing and rapid electrification of global energy demand and the increase of wind and solar sources in the energy mix is expected to lead to massive growth of the world’s electricity transmission and distribution systems, according to global quality assurance and risk management company DNV GL. DNV GL published its new Energy Transition Outlook 2018 last week which included sub-sections focusing on Oil & Gas, Maritime, and Power Supply & Use, which provided an outlook of the global energy landscape through to 2050. The Power Supply & Use report forecasts continuing “rapid electrification” of energy demand leading to electricity accounting for 45% of total energy demand in 2050, driven by “substantial” electrification in the transport, buildings, and manufacturing sectors. Specifically, the electrification of the transport sector will result in 50% of all new cars sold in 2027 throughout Europe being electric vehicles (EVs). The energy sector will similarly see significant electrification through the increase of renewable energy sources which will account for an estimated 80% of global electricity production in 2050. Wind and solar will account for a significant share of electricity generation due to continued declines in technology costs, and by 2050 solar PV will provide 40% of electricity generation and wind energy 29%. 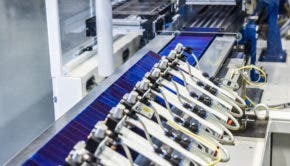 DNV GL expects that high percentages of solar and wind will result in the need for increased market mechanisms and changes to market fundamentals in many countries requiring large-scale regulatory intervention. This rapid electrification will also lead to major expansion of electricity transmission and distribution systems both in the length and capacity of transmission lines, with the total installed power line length and capacity expected to triple by 2050. Despite all this, DNV GL expects energy to become more affordable and it is expected that the total cost of energy expenditure as a share of global GDP will fall from 5.5% to 3.1% by 2050, a drop of 44%. Absolute energy expenditure will still of course increase, by 30% according to DNV GL, to $6 trillion a year, but this will take place alongside natural GDP growth which will grow at a faster rate than energy expenditure. DNV GL also expects to see a shift in costs, from operational expenditure to capital expenditure and from 2030 more capital expenditures will go into electricity grids and wind and solar than into fossil fuel projects.